Immunotherapy of cancer is attractive because of its potential for specificity and limited side effects. The efficacy of this approach may be improved by providing adjuvant signals and an inflammatory environment for immune cell activation. We evaluated antitumor immune responses in mice after treatment of OVA-expressing B16-F0 tumors with single (15 Gy) or fractionated (5 × 3 Gy) doses of localized ionizing radiation. Irradiated mice had cells with greater capability to present tumor Ags and specific T cells that secreted IFN-γ upon peptide stimulation within tumor-draining lymph nodes than nonirradiated mice. Immune activation in tumor-draining lymph nodes correlated with an increase in the number of CD45+ cells infiltrating single dose irradiated tumors compared with nonirradiated mice. Similarly, irradiated mice had increased numbers of tumor-infiltrating lymphocytes that secreted IFN-γ and lysed tumor cell targets. Peptide-specific IFN-γ responses were directed against both the class I and class II MHC-restricted OVA peptides OVA257–264 and OVA323–339, respectively, as well as the endogenous class I MHC-restricted B16 tumor peptide tyrosinase-related protein 2180–188. Adoptive transfer studies indicated that the increased numbers of tumor Ag-specific immune cells within irradiated tumors were most likely due to enhanced trafficking of these cells to the tumor site. Together these results suggest that localized radiation can increase both the generation of antitumor immune effector cells and their trafficking to the tumor site. An increasing number of studies report the persistence of various malignancies within both mice and humans after immunotherapy, while tumor Ag-specific T lymphocytes are readily observed within the host circulation (1, 2, 3). Failure of the immune response to eliminate growing tumors is often associated with a lack of appropriate T cell effector functions and limited infiltration of immune cells into the tumor tissue (4). The tumor microenvironment and local cytokine milieu are often suppressive toward immune function and can actively induce immune cell anergy or death (5, 6). These observations suggest that immune activation to tumors may be limited in the absence of other treatment modalities. Combining immunotherapy with other treatments that increase inflammation at the tumor site may provide the necessary signals for both effector T cell generation and subsequent recruitment into tumors. Ionizing radiation has long been a primary treatment modality for cancer. Its efficacy, however, is limited by a number of parameters, including the oxygenation status of the tumor, the inherent radiation sensitivity of the tumor cells, and outgrowth of metastases at distant sites (7, 8, 9, 10). Importantly, tumor irradiation also elicits several immunomodulatory effects in vivo. A variety of different cell types within tumors has been described to undergo apoptotic cell death after local irradiation, including tumor cells, APCs, T cells, stromal cells, and vascular endothelial cells (reviewed in Ref. 11). Additionally, radiation can induce expression of genes in these cell types with immunomodulatory properties such as MHC class I and II, adhesion and costimulatory molecules, death receptors, tumor Ags, and cytokines (12, 13, 14). These radiation-induced changes to the tumor microenvironment may serve as an adjuvant for immunotherapy. Several groups have reported synergistic effects in combining radiation with immunotherapy; however, the mechanisms involved remain poorly understood (15, 16, 17, 18). A critical requirement for successful combination of these therapies in the clinic will be determining how tumor irradiation affects any existing antitumor immune response that may be present and how that response is changed following radiation treatment. In both experimental and clinical settings, therapeutic success has been associated with low initial tumor burdens (19). Therefore, an antitumor immune response may be most useful in eliminating any radioresistant cells following treatment at the primary tumor site and in preventing outgrowth of tumor metastases. Current clinical practices involve treating patients with a series of fractionated radiation doses to limit toxicity (20). However, this may be detrimental for immunotherapy because repeated radiation-induced damage to immune cells within tumors may severely compromise their effectiveness and prevent their recirculation and the development of systemic protection. An unanswered question is how current radiation treatments affect the immune system’s antitumor response. The tumor cell death that occurs as a result of such treatment is likely to generate the release of tumor Ags, but it is not known whether this is released in an immunologically relevant form and whether functional APCs are present and capable of delivering Ag to the draining lymph nodes. In this study, we have used the B16-F0 melanoma engineered to express the defined Ag, OVA, to systematically address how local radiation treatment affects each parameter of the immune response, including Ag presentation, tumor peptide-specific effector cell generation and function, and effector cell migration into the tumor. Although other studies have addressed individual parameters, the current study examines each step in the generation of antitumor immunity and how local tumor irradiation affects the process. In this study, we report that local tumor irradiation increases the Ag-presenting capability within tumor-draining lymph nodes and increases the numbers of T cells within tumor-draining lymph nodes that secrete IFN-γ upon tumor peptide stimulation. Radiation further increased the numbers of immune cells infiltrating the tumors, including tumor-infiltrating lymphocytes (TIL)4 that both secrete IFN-γ upon tumor peptide stimulation and exhibit lytic activity. C57BL/6J mice were purchased from The Jackson Laboratory. Guidelines for the humane treatment of animals were followed, as approved by the University Committee on Animal Resources. TCR transgenic OT-1 and P14 mice were a kind gift from A. Livingstone and T. Mosmann (University of Rochester, Rochester, NY), respectively. The B16-F0 cell line, a C57BL/6 (H-2b) spontaneously arising melanoma, was obtained from the American Type Culture Collection (CRL 6322). B16-F0 cells transfected to express chicken OVA have been previously described (B16/OVA) (21). Yac-1 is an H-2a lymphoma derived from an A/Sn mouse (22). Tumor cell lines were maintained in MAT/P medium (U.S. patent 4.816.401) supplemented with 100 U/ml penicillin, 100 mg/ml streptomycin, and 2% FCS. Tumor cells in 100 μl of HBSS (Sigma-Aldrich) were injected i.m. into the thighs of C57BL/6J mice. Mean thigh diameters were determined, as described previously (23). Irradiation was performed on nonanesthetized tumor-bearing mice using a 137Cs source operating at a dose rate of 4.0 Gy/min. Each mouse was confined to a plastic jig with its tumor-bearing leg extended through an opening in the side to allow the tumor site to be irradiated locally. Mice received either a single local dose of 15 Gy on day 7 of tumor growth or received five daily doses of 3 Gy on days 7–11 (5 × 3 Gy) of tumor growth. Mice were sacrificed for analysis 14 days after tumor initiation. Tumor-draining lymph nodes (inguinal and iliac nodes), nondraining lymph nodes (inguinal and iliac nodes from opposite leg and mesenteric nodes), and spleens were removed from mice 14 days after tumor initiation. Dissociated cells were washed three times with medium to remove any exogenous tumor Ags and then incubated with the B3Z T cell hybridoma to assess Ag presentation, as previously described (24). Briefly, B3Z cells recognize the OVA257–264 peptide presented by H-2b MHC and express lacZ upon activation. A total of 5 × 105 lymph node cells was incubated with 5 × 105 B3Z cells in 96-well flat-bottom plates and incubated for 18 h at 37°C. The cultures were washed with PBS, and cells were fixed with cold 2% formaldehyde with 0.2% glutaraldehyde for 10 min at 4°C. They were washed again with PBS and overlaid with 0.5 mg/ml 5-bromo-4-chloro-3-indolyl-β-d-galactopyranoside (Fisher Biotech). The number of blue cells in each well was counted microscopically after 8- to 12-h incubation at 37°C. Blue cell counts were normalized for lymph node cellularity, and values are presented as activated hybrids per lymph node. TILs were purified from dissected tumors using paramagnetic beads conjugated to anti-Thy-1 Ab (T24/40.7) and were used as effector cells in a standard chromium release assay, as previously described (25, 26). TILs were pooled from two to three tumors for each effector cell population due to the reduced size of the irradiated tumors. Target cells included parental B16-F0 cells and B16/OVA cells that had been cultured in the presence or absence of murine rIFN-γ at 20 ng/ml for 72 h to induce increased surface expression of class I MHC. The Yac-1 line, which is sensitive to NK cell-mediated lysis, was used to detect these cells within our TIL preparations (22). Cytokine production by Ag-specific T cells from the draining lymph node and tumor was evaluated using IFN-γ-specific ELISPOT assays. Multiscreen Immobilon-P plates (Millipore) were coated overnight at 4°C with 3 μg/ml rat anti-mouse IFN-γ (clone AN-18.17.24). A total of 2 × 105 lymph node cells and 8 × 104 TILs was added to the top wells and diluted by 2-fold dilutions. A total of 2 × 105 naive splenocytes was added to each well in the presence of 10 μg/ml OVA257–264, 10 μg/ml OVA323–339, 10 μg/ml tyrosinase-related protein 2 (TRP-2)180–188, or no Ag. After an 18-h culture, the plates were washed extensively; IFN-γ was detected using biotinylated R4-6A2 Ab; and spots were developed using 5-bromo-4-chloro-3-indolyl phosphate/NBT substrate. Spots were enumerated using a dissecting microscope. Two-color flow cytometric analysis was performed on dissociated tumor cell suspensions using anti-mouse CD45 conjugated to the fluorochrome allophycocyanin and a PE-conjugated Ab to CD4, CD8, CD11b, or CD11c (BD Pharmingen). Infiltrating host cell numbers for each marker were calculated as the percentage of CD45-positive cells staining positive for each marker minus the percentage of cells staining positive with isotype-matched control Abs, times the total number of viable cells isolated from each tumor. These numbers were then normalized using the total weight of each excised tumor. Tumor-specific primed T cells were obtained from OT-1 (Rag−/−) mice immunized with 20 μg of OVA257–264 peptide (SynPep) emulsified in CFA (Sigma-Aldrich) and injected s.c. into the left flank and at the nape of the neck, whereas control T cells were from P14 transgenic mice immunized in the same manner with lymphocytic choriomeningitis virus gp5133–41 peptide (gift from T. Mosmann). Seven days after priming, the mice were sacrificed by CO2 inhalation, and the draining lymph nodes (iliac, inguinal, axillary, popliteal) and spleen were harvested. CD8+ T cells were enriched through negative selection using Dynal beads conjugated with anti-CD4 and anti-B220 (Dynal Biotech). Following CD8+ T cell enrichment, the OT-1 cells were labeled with 5-(and-6)-4-chloromethyl benzoyl amino tetramethylrhodamine (Molecular Bioprobes) and the P14 cells with CFSE (Molecular Bioprobes) for 45 min at room temperature. In one of the three experiments, the labels were reversed. A total of 3 × 106 of each cell type (6 × 106 total cells) was then injected i.v. into C57BL/6 mice that had been challenged with 1 × 105 B16/OVA tumor cells 7 days earlier. 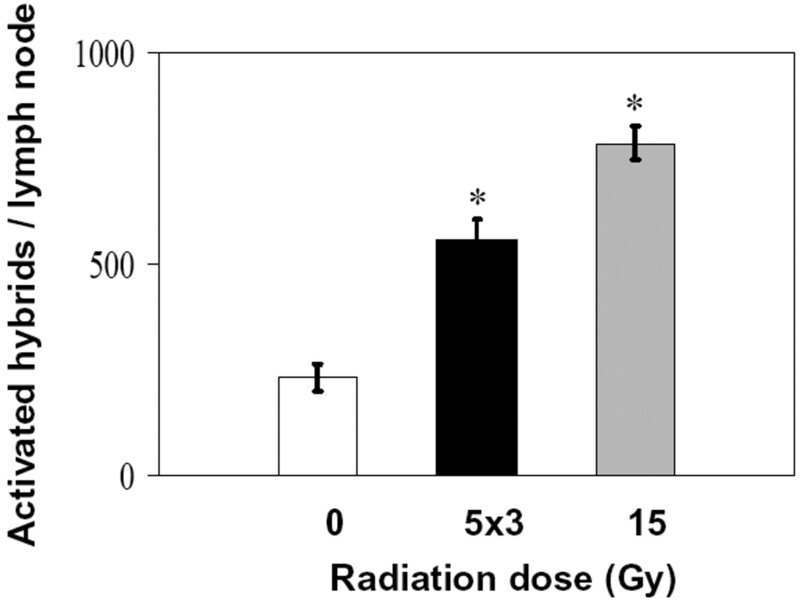 Immediately preceding T cell transfer, one group of mice received 15 Gy of local tumor irradiation, another group received the first fractionated dose (3 Gy), and one group received no irradiation. Mice that received the first fractionated dose were similarly irradiated on each of the next 3 days. Mice from each group were sacrificed 24 and 72 h after cell transfer, their tumors were removed, and whole mounts were prepared, as described below and viewed by fluorescent microscopy for the presence of transferred T cells. The entire tumor was evaluated in each case, and the number of labeled cells per unit area was determined for each tumor. Tumor vasculature analysis was performed using whole mount histology, as previously described (27). Briefly, small pieces of the tumor were excised and incubated in staining buffer (1% BSA, 0.1% sodium azide, in PBS). Samples were first blocked using Fc block with shaking at 4°C for 10 min. The primary Abs, FITC-conjugated anti-VCAM-1 and PE-conjugated anti-CD31, were added directly to the tubes at the predetermined concentration and incubated with shaking at 4°C for 2 h. Samples were then washed twice with additional staining buffer at 4°C for 1 h. Stained tumor samples were then viewed using a fluorescent microscope connected to a monochrome CCD digital camera. A bandpass filter cube combination designed to detect FITC and PE wavelengths separately was used to acquire images for corresponding fields of view. Monochrome images from corresponding fields of view were then pseudocolored and overlaid using Image Pro Plus software version 5.0 (Media Cybernetics). A nonparametric (Kruskal-Wallis) rank sum test was used for one-way ANOVA, followed by multiple comparison procedures (Dunn’s test or Holm-Sidak, as indicated) to compare dose responses in control vs irradiated groups. Statistical significance was assessed at p < 0.05 for all comparisons. We compared the ability of either a single dose or a fractionated dose schedule of local ionizing radiation to control the growth of tumors in C57BL/6J mice. Tumors were initiated in the thigh muscle by injecting 1 × 105 B16-F0 cells, which had previously been transfected to express OVA (B16/OVA). Mice were either nonirradiated, irradiated with a single dose of 15 Gy on day 7 of tumor growth, or irradiated with five daily doses of 3 Gy on days 7–11 (5 × 3 Gy) of tumor growth, and tumor size was monitored (Fig. 1⇓). The single dose of 15 Gy was selected to cause considerable tumor cell death, but not high enough to eliminate the tumors, whereas the fractionated dose was selected to more closely mimic clinical protocols. Nonirradiated mice developed large tumor burdens by day 14 of tumor growth, at which time the mice were sacrificed for analysis. A single dose of 15 Gy was quite effective in controlling tumor growth during this initial time period. Although barely detectable via external measurement, small, pigmented masses of viable tumor were found and extracted from these mice through careful dissection of the muscle tissue surrounding the injection site. Mice that had received the single radiation dose and were not used for analysis on day 14 had to be sacrificed by day 30 due to large tumor burdens (data not shown). Surprisingly, the fractionated dose schedule was only marginally effective in slowing tumor growth compared with nonirradiated controls. In the long-term, neither of the treatments was effective in preventing tumor growth. Tumor growth after different doses of ionizing radiation. B16/OVA tumors were initiated in the thigh muscle of C57BL/6 mice by injecting 1 × 105 viable cells. Tumors were either nonirradiated (solid black lines), irradiated with five daily local doses of 3 Gy on days 7–11 (dotted black lines), or irradiated with a single local dose of 15 Gy on day 7 (solid gray lines). Mean thigh diameters were measured using calipers. Each line represents an individual mouse. ∗, p < 0.001 for 15 Gy of treatment compared with 0 Gy on day 14. The primary function of tumor radiotherapy is to eliminate tumor cells by triggering their death through apoptosis or necrosis. Extensive acute cell death releases a bolus of tumor Ags within an environment containing inflammatory mediators and immune cells associated with tissue distress (28). We hypothesized that these conditions might facilitate tumor Ag uptake by resident APC and trigger their subsequent maturation and migration to draining lymph nodes. To test this hypothesis, we used the T cell hybridoma B3Z, which recognizes the OVA257–264 peptide presented by H-2b MHC to detect and evaluate APC-carrying OVA tumor Ags within the tumor-draining lymph nodes of irradiated and nonirradiated mice (Fig. 2⇓). B3Z cells are engineered to express bacterial β-galactosidase enzyme upon TCR stimulation and can be visualized as blue cells upon processing with the substrate 5-bromo-4-chloro-3-indolyl-β-d-galactopyranoside (24). The single dose radiation treatment resulted in a 3-fold increase in the number of B3Z cells activated by day 14 tumor-draining lymph node cell preparations compared with the number of B3Z activated by lymph node cells from nonirradiated mice. Mice that received the fractionated dose also demonstrated increases in APC activity within draining lymph nodes to a lesser degree. Cell preparations made from nodes not draining the tumor site (mesenteric nodes) stimulated very few (<100) B3Z in all of the groups tested. Based on our previous studies (29) using the B3Z cells to quantify individual APC, we conclude that local tumor irradiation increases both the number and Ag-presenting capabilities of APC within the tumor-draining lymph nodes. Radiation increases the number of APC within tumor-draining lymph nodes capable of activating an OVA257–264 peptide-specific T cell hybrid in vitro. Tumor-draining lymph nodes were removed 14 days after tumor initiation with B16/OVA cells from nonirradiated mice (□), mice irradiated with five daily local doses of 3 Gy on days 7–11 (▪), or mice irradiated with a single local dose of 15 Gy on day 7 (▦). Lymph node cells were incubated with the OVA257–264 peptide-specific T cell hybrid B3Z in vitro for 16 h. Activated hybrids were enumerated microscopically by counting blue cells, and values were normalized for lymph node cellularity. Results are averages ± SEM of three independent experiments. Nondraining mesenteric lymph nodes stimulated fewer than 100 blue cells in all mice. ∗, p < 0.001 (Holm-Sidak method) for mice receiving radiation treatment compared with nonirradiated mice. We further evaluated the extent to which tumor irradiation facilitated the priming and expansion of tumor Ag-reactive T cells in vivo. Tumor-draining lymph node cells from irradiated and nonirradiated mice were stimulated in vitro with various peptides derived from known tumor Ags in our model. The frequency of IFN-γ-secreting cells was then determined in an ELISPOT assay (Fig. 3⇓). In addition to stimulation with the class I and class II MHC-restricted OVA peptides OVA257–264 and OVA323–339, respectively, we also examined responses directed against the endogenous B16 tumor Ag TRP-2 using the class I MHC-restricted peptide TRP-2180–188 (28, 29). Tumor-draining lymph node cells from mice that received the single dose irradiation responded strongly to all three peptides with frequencies of IFN-γ-secreting cells that were 3–5 times greater than those from nonirradiated mice. Interestingly, lymph node responses from mice that received the fractionated dose were intermediate between those of the nonirradiated and single dose-treated mice for both class I MHC-restricted peptides, but were equivalent to the single dose frequencies for the class II MHC-restricted peptide. As expected, very few cells from nondraining lymph nodes responded to peptide stimulation (data not shown). Thus, irradiation of the tumor increases the number of immunogenic APCs and concomitantly the generation of Ag-specific T cells. Taken together, these results suggest that tumor irradiation functions as an immunological adjuvant by providing tumor Ags within the appropriate context for stimulating effector T cell expansion. Radiation increases the frequency of cells secreting IFN-γ in response to tumor-derived peptides within tumor-draining lymph nodes. Tumor-draining lymph nodes were removed 14 days after tumor initiation with B16/OVA cells from nonirradiated mice (□), mice irradiated with five daily local doses of 3 Gy on days 7–11 (▪), and mice irradiated with a single local dose of 15 Gy on day 7 (▦). Lymph node cells were incubated for 16 h with APC in the presence of the tumor-derived peptides OVA257–264 (top panel), OVA323–339 (middle panel), or TRP-2180–188 (bottom panel). IFN-γ ELISPOTs were enumerated microscopically and normalized for lymph node cellularity. Results are averages ± SEM of three independent experiments. Lymph node cultures without peptide stimulation produced fewer than 120 spots. ∗, p < 0.001 (Holm-Sidak method) for mice receiving radiation treatment compared with nonirradiated mice. Local tumor irradiation has been shown to increase host immune cell infiltration into a number of solid tumors (30, 31, 32, 33, 34). 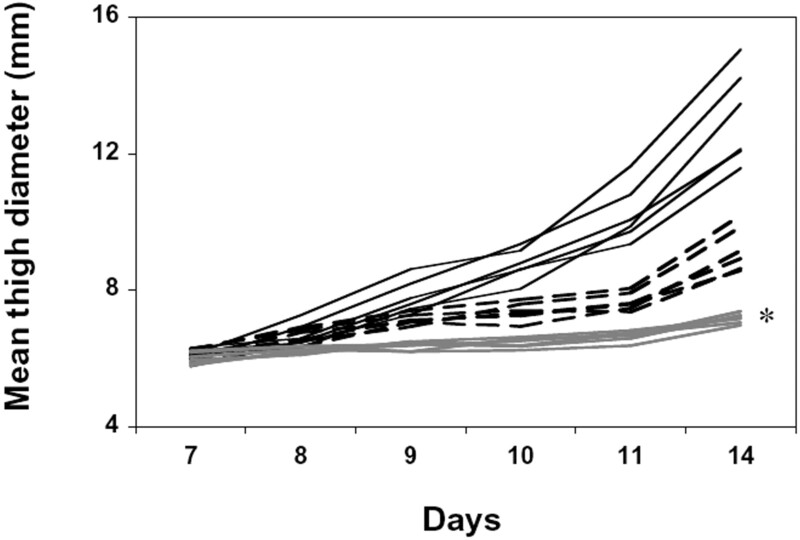 We evaluated the ability of the day 7 single dose (15 Gy) and days 7–11 fractionated dose (5 × 3 Gy) treatments to influence the immune cell composition of B16/OVA tumors on day 14 of tumor growth. Immunostaining and flow cytometry were used to compare the numbers of total immune cells (CD45+) and various immune cell subtypes (CD45 plus specific host cell marker double positive) present within the nonirradiated and irradiated tumors (Fig. 4⇓). Nonirradiated mice consistently had low numbers of immune cells infiltrating their tumors. Although there was some variation in the overall immune cell composition of the irradiated tumors, averages for total CD45+ cells and for each cell subtype were consistently higher in irradiated mice than in nonirradiated mice. An increase in the density of both macrophages and dendritic cells (DCs) was observed, an expected result, given the tumor cell death that occurs from the radiation. For each cell type analyzed, the average numbers of immune cells per mg tumor were higher in the mice that received the single radiation dose than in mice that received the fractionated dose. Phenotype of host cells infiltrating B16/OVA tumors after various doses of irradiation. Tumors were removed from mice that were nonirradiated (○) (n = 5), irradiated with 5 × 3 Gy (•) (n = 6), or irradiated with 15 Gy (gray circles) (n = 7) on day 14 of tumor growth. Cell suspensions were double stained with an allophycocyanin-conjugated anti-CD45 Ab and a PE-conjugated Ab against another host cell marker, as indicated, and analyzed by flow cytometry. Shown are numbers of positively staining cells per mg of tumor. Each circle represents analysis of a cell type within a single tumor. Black bars are average values in each category. ∗, p < 0.05 (Dunn’s method) for mice receiving radiation treatment compared with nonirradiated mice. To determine whether the increased numbers of T cells infiltrating irradiated tumors could recognize tumor Ags and carry out effector functions, we purified Thy-1-positive TILs from day 14 dissociated tumors (25). 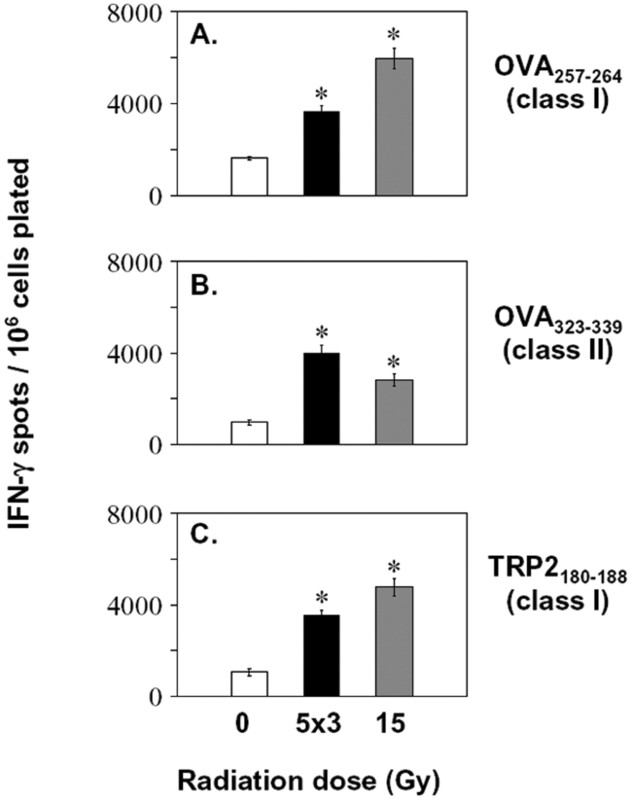 These cells were incubated with APCs carrying the tumor Ag-derived peptides OVA257–264, OVA323–339, or TRP-2180–188, and the frequencies of IFN-γ-secreting cells were determined by ELISPOT assay (Fig. 5⇓). TILs isolated from both single and fractionated dose irradiated tumors contained higher frequencies of cells that secreted IFN-γ in response to peptide stimulation than TILs from nonirradiated tumors. Interestingly, the responses to both class I MHC-restricted peptides (OVA257–264 and TRP-2180–188) were higher in the single dose tumors than the fractionated dose tumors (Fig. 5⇓, A and C). In contrast, TILs from the fractionated dose tumors responded more strongly to the class II MHC-restricted peptide (OVA323–339) than cells from the single dose irradiated tumors (Fig. 5⇓B), mirroring what was observed in the draining lymph node. Radiation increases the frequency of TILs secreting IFN-γ in response to tumor-derived peptides. TILs were purified from B16/OVA tumors 14 days after tumor initiation in nonirradiated mice (□), mice irradiated with five daily local doses of 3 Gy on days 7–11 (▪), and mice irradiated with a single local dose of 15 Gy on day 7 (▦). TIL were pooled from two to three tumors to generate each effector cell population. These were incubated for 16 h with APC in the presence of the tumor-derived peptides OVA257–264 (A), OVA323–339 (B), or TRP-2180–188 (C). IFN-γ ELISPOTS were enumerated microscopically. Results are averages ± SEM for two to three independent experiments. ∗, p < 0.001 (Holm-Sidak method) for mice receiving radiation treatment compared with nonirradiated mice. We also tested the isolated TILs for their ability to lyse chromium-labeled tumor cell targets. Target cells included B16/OVA cells either treated or untreated with exogenous IFN-γ to induce class I MHC expression, untransfected B16 cells treated with IFN-γ and Yac-1 cells. TILs from nonirradiated tumors displayed moderate lytic activity against both class I MHC-induced targets and the NK cell-sensitive Yac-1 target cells, whereas the class I MHC low untreated B16/OVA target cells were not lysed (Fig. 6⇓A). This pattern of target cell killing was similar using TIL from fractionated dose irradiated tumors (Fig. 6⇓B), but was enhanced in the killing of class I MHC-induced targets using TILs from single dose irradiated tumors (Fig. 6⇓C). These results suggest that tumor irradiation is an effective adjuvant for eliciting the continued presence of specific effector cells within the tumors that recognize tumor Ags, secrete IFN-γ, and kill tumor cells in a class I MHC-restricted manner 14 days after radiation therapy initiation. Lytic activity of TILs from non-irradiated and irradiated tumors. TILs were purified from B16/OVA tumors 14 days after tumor initiation in non-irradiated mice (A), mice irradiated with 5 daily local doses of 3 Gy on days 7–11 (B), and mice irradiated with a single local dose if 15 Gy on day 7 (C). TIL were pooled from two to three tumors to generate each effector cell population. These were incubated in a 6-h chromium release assay with labeled tumor cell targets as follows: ♦, B16/OVA + IFN-γ (class I high); ▴, B16/OVA (class I low); ▪, B16 + IFN-γ (class I high); •, Yac-1 (NK sensitive). IFN-γ was pre-incubated with the indicated target cells to induce class I MHC expression. Data are representative of four independent experiments for each treatment. We next investigated the mechanism by which local tumor irradiation in either single or fractionated doses elevated the numbers of T cells in tumors with reactivity to tumor Ags. To directly address whether this localization was Ag specific, we adoptively transferred equal numbers of fluorescently labeled CD8+ T cells from two distinct TCR transgenic lines into irradiated or nonirradiated tumor-bearing mice. We then evaluated the ability of the transferred cells to traffic into the tumors after 24 and 72 h (Fig. 7⇓). OT-1 cells, which recognize the OVA257–264 peptide via MHC class I, were used to measure trafficking of tumor Ag-specific cells into B16/OVA tumors. P14 cells recognize the lymphocytic choriomeningitis virus peptide gp5133–41 and were used to evaluate the trafficking of cells lacking tumor Ag specificity. Whole mount fluorescence microscopy of individual tumors revealed increased numbers of transferred OT-1 cells at 24 and 72 h in tumors of both irradiated and nonirradiated mice. In contrast, the number of transferred P14 cells remained relatively constant among the groups. The increased numbers of T cells observed at 24 h were most likely due to increased infiltration or retention (a process we will refer to as trafficking) of OT-1 cells to tumor vascular endothelium and not to differential proliferation of the transferred cells in vivo (Fig. 7⇓, A and C). This difference in cellular trafficking was further amplified by tumor irradiation before cell transfer, suggesting that the enhanced presence of endogenous tumor Ag-reactive T cells in irradiated tumors is partially due to increased trafficking. Importantly, OT-1 cells were found in consistently high numbers at both 24 and 72 h after transfer in tumors that received the single 15 Gy dose (Fig. 7⇓C). 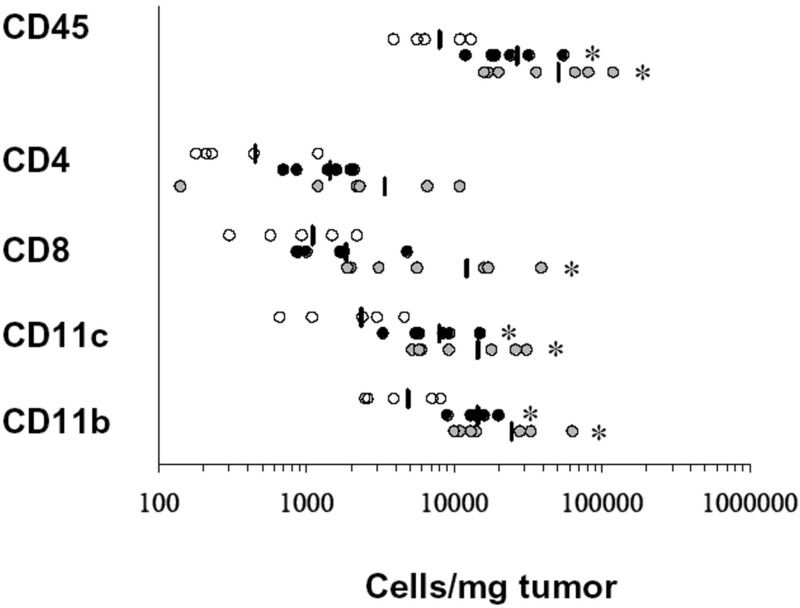 In contrast, the numbers of these cells decreased between 24 and 72 h in tumors that received one 3 Gy dose or three 3 Gy doses, respectively (Fig. 7⇓B). This decrease might be due to the radiation killing-activated T cells present during the subsequent radiation treatments. Together these data suggest that tumor Ag-reactive CD8+ T cells are better able to traffic to and infiltrate tumors than nonspecific CD8+ T cells. Radiation enhances the ability of tumor Ag-specific T cells to traffic to and infiltrate tumors. A total of 3 × 106 OT-1 (▪) and 3 × 106 P14 (□) CD8+ T cells, labeled with CFSE and CMTMR, respectively, were transferred into C57BL/6 mice bearing 7-day B16/OVA tumors and either untreated (A) or treated with single doses of 3 Gy (B) or 15 Gy (C). Tumors were removed either 24 or 72 h posttransfer and analyzed by whole mount fluorescent microscopy to locate migrated T cells. Tumors analyzed 72 h posttransfer in B reflect mice that had received three consecutive daily doses of 3 Gy (a total of 9 Gy). Results are averages ± SEM of three independent experiments. Whole mount histology on tumor samples either untreated (D) or treated with 3 Gy (E) or 15 Gy (F) 24 h after treatment. Overlaid images on corresponding fields are pseudocolored green for CD31 and red for VCAM-1. ∗, p < 0.01 (Holm-Sidak method) for number of OT-1 cells/field of view in 15 Gy-treated tumors compared with 0 Gy-treated tumors 72 h posttreatment. One possible mechanism for the observed trafficking patterns of transferred T cells is the up-regulation of the adhesion molecule VCAM-1 on tumor vasculature. We sought to determine whether the increased infiltration and retention of tumor Ag-reactive T cells correlated with the expression of VCAM-1 on blood vessels within tumors. Whole mount histology was performed on tumor samples 24 h after radiation treatment using anti-CD31 (green) to identify blood vessels and anti-VCAM-1 (red). Tumors that had been irradiated with either single doses of 3 or 15 Gy were found to have up-regulated VCAM-1 on the blood vessels (Fig. 7⇑, E and F), whereas this up-regulation was not discernible in vessels from untreated tumors (Fig. 7⇑D). Interestingly, VCAM-1 was not expressed uniformly on all of the vessels, but rather was patchy, as if the effects were localized. A similar effect of tumor irradiation on VCAM-1 expression also was observed on vessels 72 h and 7 days after radiation treatment (data not shown). The presence of VCAM-1 on tumor vasculature suggests that local irradiation creates a tumor microenvironment that selects for increased infiltration and retention of tumor Ag-reactive CD8+ T cells. Radiation therapy is one of the major modalities used in the treatment of cancer. The goal of such treatment is to cause sufficient tumor cell destruction to prevent or limit tumor regrowth while minimizing normal tissue damage. A frequently overlooked byproduct of this damage to the tumor cells is the creation of a large amount of tumor Ag in the form of necrotic and apoptotic tumor cells and cellular debris, which has the potential to stimulate an immune response (35, 36, 37). Unfortunately, radiation alone is sometimes unable to completely eradicate tumors, and thus, there has been considerable interest in combining conventional tumor radiotherapy with novel immunotherapies to control tumor growth (38, 39, 40, 41). However, few studies have assessed the response that results from the increase in tumor Ag following radiotherapy. Characterizing this resulting immune response to the irradiated tumor and determining which aspects of the response are limiting and require boosting are important for developing more efficacious combination regimens. The data obtained in the current study suggest that localized tumor irradiation does indeed enhance both the generation of specific T cells and their localization to the tumor sites. This enhancement was observed with both the fractionated treatment (5 × 3 Gy) designed to minimize normal tissue damage and mimic clinical protocols and the single high dose (15 Gy) treatment, selected to cause extensive tumor cell death. Although evaluation of the antitumor immune response rather than tumor cure was the goal of these experiments, both treatment protocols had a marked effect on tumor growth. An important first step in the generation of immunity is delivery of Ag to draining lymph nodes for stimulation of specific lymphocytes (42). We hypothesized that local irradiation of tumors would liberate large amounts of tumor Ag that would be available for presentation by APCs. Furthermore, radiation damage would provide the necessary inflammatory signals to induce APC maturation and migration to draining lymph nodes, where they could activate naive T cells. In this study, we have shown that tumor irradiation significantly increased the number and activation status of APCs within draining lymph nodes that carried the tumor-derived peptide OVA257–264 and could activate the T cell hybrid B3Z. Because OVA is a secreted soluble protein, it is possible that some of the Ag traveled directly to the lymph node via the lymphatics. Ag could then be taken up by resident DC and presented by these intralymph node APCs rather than being transported by APCs migrating from within the tumor. However, it is important to note that tumor irradiation also increased the numbers of T cells in draining nodes secreting IFN-γ in response to peptides derived from TRP-2, a nonsecreted self Ag expressed in B16 cells and endogenous melanocytes (29). This makes it highly likely that some of the APCs present in draining lymph nodes of irradiated mice are cells that have picked up Ag at the tumor site and migrated to the draining node. We also observed that irradiated tumors had increased numbers of infiltrating immune cells expressing CD11c and/or CD11b, surface markers indicative of APCs. Therefore, tumor irradiation may further enhance Ag uptake and subsequent presentation by encouraging greater numbers of APCs to traffic from the bloodstream into the tumor. Much is known about the requirement of APCs for the induction of immune responses (42); however, there is much less information available on the induction of immune responses following radiation-mediated tumor destruction in vivo. We have characterized the frequency of IFN-γ-secreting CD4+ and CD8+ T cells within the tumor-draining lymph node. 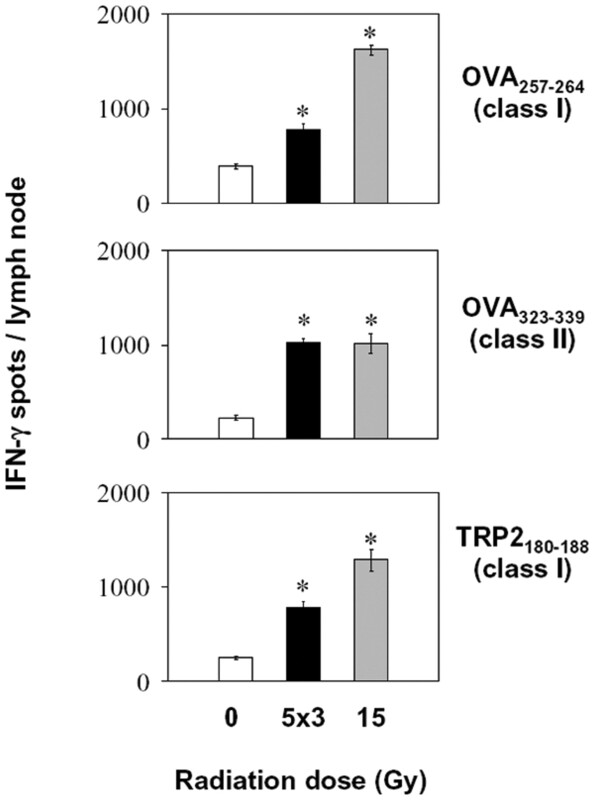 The numbers of CD8+ T cells specific for OVA and TRP-2 were increased in lymph nodes draining irradiated tumors, suggesting greater Ag presentation, as observed with the B3Z assay, and a subsequent increase in proliferation of the primed T cells in this lymph node. Particularly interesting is the increase in the number of CD8+ T cells against the self Ag, TRP-2, following irradiation of the tumor. This would suggest that the T cells against this self Ag have not been tolerized, but in the absence of treatment fail to respond to the Ag expressed by a progressively growing tumor. The increase in the numbers of Ag-specific T cells in the lymph nodes draining irradiated tumors also suggests that the APCs found within them are immunogenic and not tolergenic, perhaps because the irradiation has created an inflammatory environment (43, 44). However, the antitumor immune response induced by irradiation alone was still not sufficient to prevent eventual tumor outgrowth in our study. These findings and those from a recent study, which has shown a synergistic antitumor effect in mice treated with local irradiation and intratumoral injections of DCs (45), indicate that DCs may be limiting and that increasing their numbers and function may increase tumor destruction. Thus, it is possible that tumors grow out despite increased numbers of T cells in the draining lymph node because of the inadequate Ag presentation in lymph nodes. It may be necessary to deliver more APCs presenting tumor Ag to see a long-term antitumor effect, especially if given at an early time point before T cells become exhausted, anergic, or apoptotic. Another consideration is whether irradiation directly affects the function of DCs. There is relatively little information available, but a very recent study has shown that 10 Gy of radiation affects the ability of DCs to present endogenously produced Ag, but not exogenous Ag (46). Thus, local irradiation would probably not be detrimental to resident DCs or transferred DCs that had been loaded with peptide, but might well inhibit presentation of Ags expressed in the DCs by viral transduction. We have observed that irradiation causes a significant infiltration of CD45+ immune cells into the tumors. Analysis by two-color flow cytometry determined that many of these immune cells were CD11b+ and/or CD11c+, markers indicative of macrophages and DCs. This infiltration is most likely a result of chemokines known to be released by stressed tumor and stromal cells (47). In addition to cell damage and release of tumor Ag, local tumor irradiation can also create an inflammatory environment within the tumor. This altered environment can affect not only the trafficking of DCs out of the tumor, but also infiltration by activated T cells. Reports by several groups have demonstrated the inability of activated T cells to traffic effectively into solid tumors (19). Studies in models of spontaneous multistep tumorigenesis have reported early changes in vasculature and reduced leukocyte-endothelium interactions, indicating that barriers to lymphocyte migration may be an early event in tumorigenesis (48). However, in this same system, whole body irradiation was shown to create a tumor microenvironment conducive to migration of adoptively transferred lymphocytes (43). In normal tissue, radiation creates an inflammatory response, resulting in the up-regulation of cytokines, chemokines, and adhesion molecules (12, 49). Our studies have shown that radiation-induced damage can up-regulate VCAM-1 expression on tumor vessels, thus making them amenable to T cell migration, as has recently been shown for other types of inflammatory mediators (50). We found that radiation had a marked effect on the ability of primed tumor-specific CD8+ T cells to traffic to the tumors. Because the number of transferred T cells found in the tumors reflects not only their infiltration into the tumor, but also their ability to survive within the tumor microenvironment, be retained, and possibly proliferate, it is difficult to discern exactly what is occurring. However, by looking at an early time point, 24 h posttransfer, when proliferation is probably limited, we are able to conclude that there is preferential retention/survival of specific OT-1 cells compared with the nonspecific P14 cells (Fig. 7⇑). Due to the limited number of cells available, we were unable to evaluate T cell proliferation within the tumors. However, both the tumor-specific OT-1 and the nonspecific P14 cells had similar dye dilution/proliferation profiles within the draining lymph node and spleen (data not shown) owing to their programmed expansion following stimulation by peptide emulsified in CFA. The failure to observe VCAM-1 expression on the vessels within the untreated tumors is consistent with the interpretation that the unactivated vessel phenotype contributes to the limited infiltration of T cells into these tumors, but it does not rule out the possibility that other factors, which ultimately make up an unfavorable microenvironment, contribute to the limited infiltration and/or retention of effector CD8+ T cells observed. It is unclear whether or not there is proliferation of the OT-1 cells within the single dose irradiated tumors, although the density of cells is not markedly increased at 72 h compared with the early time point, suggesting that little proliferation is occurring. It is feasible that the T cells could proliferate given the high numbers of APCs within the tumors. However, other conditions within the tumor may limit proliferation. A slight decline in the number of lymphocytes 72 h after cell transfer in the mice receiving the fractionated irradiation may be due to apoptosis induced by the radiation given post-T cell transfer. If this is the case, this will have to be taken into consideration before combining radiation and transfer immunotherapy in the clinic. It is clear from these studies that although radiotherapy alone may not always be sufficient to cure established tumors, radiation is very effective in stimulating a demonstrable immune response, not only to a foreign model Ag (OVA), but also to an endogenous tumor Ag (TRP-2). This stimulation is due not only to release of large amounts of tumor Ag, but also to changes in the tumor microenvironment that increase immune cell infiltration and retention. The changes observed in the tumor vascular following radiation appear to play an important role in the ability of activated T cells to infiltrate into the tumor in higher numbers, a necessary prerequisite for immune mediated tumor destruction. These or other radiation-induced vascular or lymphatic changes may also contribute to the enhanced migration of DCs from the tumor site to the draining lymph nodes. Effects on these conduits that allow immune cells to enter and leave the tumor site may be crucial for an effective immune response and deserve additional study. ↵1 This work was supported by National Institutes of Health Grant CA28332 and by a grant from the Sally Edelman and Harry Gardner Cancer Research Foundation. A.A.L., J.P.M., and S.A.G. were supported by National Institutes of Health Training Grant AI07285. ↵2 A.A.L. and J.P.M. contributed equally to the completion of this work. ↵4 Abbreviations used in this paper: TIL, tumor-infiltrating lymphocyte; DC, dendritic cell; TRP-2, tyrosinase-related protein 2. Gilboa, E.. 1999. How tumors escape immune destruction and what we can do about it. Cancer Immunol. Immunother. 48: 382-385. Lee, P. P., C. Yee, P. A. Savage, L. Fong, D. Brockstedt, J. S. Weber, D. Johnson, S. Swetter, J. Thompson, P. D. Greenberg, et al 1999. Characterization of circulating T cells specific for tumor-associated antigens in melanoma patients. Nat. Med. 5: 677-685. Romero, P., P. R. Dunbar, D. Valmori, M. Pittet, G. S. Ogg, D. Rimoldi, J. L. Chen, D. Lienard, J. C. Cerottini, V. Cerundolo. 1998. Ex vivo staining of metastatic lymph nodes by class I major histocompatibility complex tetramers reveals high numbers of antigen-experienced tumor-specific cytolytic T lymphocytes. J. Exp. Med. 188: 1641-1650. Foss, F. M.. 2002. Immunologic mechanisms of antitumor activity. Semin. Oncol. 29: 5-11. Malmberg, K. J.. 2004. Effective immunotherapy against cancer: a question of overcoming immune suppression and immune escape?. Cancer Immunol. Immunother. 53: 879-892. Mapara, M. Y., M. Sykes. 2004. Tolerance and cancer: mechanisms of tumor evasion and strategies for breaking tolerance. J. Clin. Oncol. 22: 1136-1151. McKenna, W. G., R. J. Muschel. 2003. Targeting tumor cells by enhancing radiation sensitivity. Genes Chromosomes Cancer 38: 330-338. Lewis, A. M., M. Su, J. Doty, Y. Chen, F. S. Pardo. 1996. Relationship between intrinsic radiation sensitivity and metastatic potential. Int. J. Radiat. Oncol. Biol. Phys. 34: 103-110. Moeller, B. J., Y. Cao, C. Y. Li, M. W. Dewhirst. 2004. Radiation activates HIF-1 to regulate vascular radiosensitivity in tumors: role of reoxygenation, free radicals, and stress granules. Cancer Cells 5: 429-441. Zhao, D., A. Constantinescu, C. H. Chang, E. W. Hahn, R. P. Mason. 2003. Correlation of tumor oxygen dynamics with radiation response. Radiat. Res. 159: 621-631. Friedman, E. J.. 2002. Immune modulation by ionizing radiation and its implications for cancer immunotherapy. Curr. Pharm. Design 8: 1765-1780. Heckmann, M., K. Douwes, R. Peter, K. Degitz. 1998. Vascular activation of adhesion molecule mRNA and cell surface expression by ionizing radiation. Exp. Cell Res. 238: 148-154. Ciernik, I. F., P. Romero, J. A. Berzofsky, D. P. Carbone. 1999. Ionizing radiation enhances immunogenicity of cells expressing a tumor-specific T-cell epitope. Int. J. Radiat. Oncol. Biol. Phys. 45: 735-741. Abdel-Wahab, Z., M. M. Dar, D. Hester, C. Vervaert, R. Gangavalli, J. Barber, T. L. Darrow, H. F. Seigler. 1996. Effect of irradiation on cytokine production, MHC antigen expression, and vaccine potential of interleukin-2 and interferon-γ gene-modified melanoma cells. Cell. Immunol. 171: 246-254. Cao, Z. A., D. Daniel, D. Hanahan. 2002. Sublethal radiation enhances anti-tumor immunotherapy in a transgenic mouse model of pancreatic cancer. BMC Cancer 2: 11. Chiang, C. S., J. H. Hong, Y. C. Wu, W. H. McBride, G. J. Dougherty. 2000. Combining radiation therapy with interleukin-3 gene immunotherapy. Cancer Gene Ther. 7: 1172-1178. Lohr, F., K. Hu, Z. Haroon, T. V. Samulski, Q. Huang, J. Beaty, M. W. Dewhirst, C. Y. Li. 2000. Combination treatment of murine tumors by adenovirus-mediated local B7/IL12 immunotherapy and radiotherapy. Mol. Ther. 2: 195-203. Plautz, G. E., M. Inoue, S. Shu. 1996. Defining the synergistic effects of irradiation and T-cell immunotherapy for murine intracranial tumors. Cell. Immunol. 171: 277-284. Mortarini, R., A. Piris, A. Maurichi, A. Molla, I. Bersani, A. Bono, C. Bartoli, M. Santinami, C. Lombardo, F. Ravagnani, et al 2003. Lack of terminally differentiated tumor-specific CD8+ T cells at tumor site in spite of antitumor immunity to self-antigens in human metastatic melanoma. Cancer Res. 63: 2535-2545. Mothersill, C. E., M. J. Moriarty, C. B. Seymour. 2004. Radiotherapy and the potential exploitation of bystander effects. Int. J. Radiat. Oncol. Biol. Phys. 58: 575-579. Brown, D. M., T. L. Fisher, C. Wei, J. G. Frelinger, E. M. Lord. 2001. Tumors can act as adjuvants for humoral immunity. Immunology 102: 486-497. Kiessling, R., E. Klein, H. Wigzell. 1975. “Natural” killer cells in the mouse. I. Cytotoxic cells with specificity for mouse Moloney leukemia cells: specificity and distribution according to genotype. Eur. J. Immunol. 5: 112-117. McAdam, A. J., B. A. Pulaski, E. Storozynsky, K. Y. Yeh, J. Z. Sickel, J. G. Frelinger, E. M. Lord. 1995. Analysis of the effect of cytokines (interleukins 2, 3, 4, and 6, granulocyte-monocyte colony-stimulating factor, and interferon-γ) on generation of primary cytotoxic T lymphocytes against a weakly immunogenic tumor. Cell. Immunol. 165: 183-192. Woods, M. L., A. J. McAdam, J. G. Frelinger, E. M. Lord. 1993. Isolation and expansion of tumor-infiltrating lymphocytes. BioTechniques 15: 970-972. Maryanski, J. L., J. Van Snick, J. C. Cerottini, T. Boon. 1982. Immunogenic variants obtained by mutagenesis of mouse mastocytoma P815. III. Clonal analysis of the syngeneic cytolytic T lymphocyte response. Eur. J. Immunol. 12: 401-406. Gerber, S. A., J. P. Moran, J. G. Frelinger, J. A. Frelinger, B. M. Fenton, E. M. Lord. 2003. Mechanism of IL-12 mediated alterations in tumor blood vessel morphology: analysis using whole-tissue mounts. Br. J. Cancer 88: 1453-1461. Sun, Y., A. J. Sijts, M. Song, K. Janek, A. K. Nussbaum, S. Kral, M. Schirle, S. Stevanovic, A. Paschen, H. Schild, et al 2002. Expression of the proteasome activator PA28 rescues the presentation of a cytotoxic T lymphocyte epitope on melanoma cells. Cancer Res. 62: 2875-2882. Bloom, M. B., D. Perry-Lalley, P. F. Robbins, Y. Li, M. el-Gamil, S. A. Rosenberg, J. C. Yang. 1997. Identification of tyrosinase-related protein 2 as a tumor rejection antigen for the B16 melanoma. J. Exp. Med. 185: 453-459. Wen, P., J. S. Loeffler, J. H. Morris, L. A. Lampson. 1990. The effects of irradiation on major histocompatibility complex expression and lymphocytic infiltration in the normal rat brain and the 9L gliosarcoma brain tumor model. J. Neuroimmunol. 27: 239-244. McBride, W. H., J. S. Economou, R. G. Syljuasen, C. Parrish, D. Hackman, V. Latham, C. S. Chiang, G. J. Dougherty. 1996. The effects of cytokine gene transfer into tumors on host cell infiltration and regression. Anticancer Res. 16: 1139-1143. Johansson, S., M. Landstrom, R. Henriksson. 1999. Alterations of tumor cells, stroma and apoptosis in rat prostatic adenocarcinoma following treatment with histamine, interleukin-2 and irradiation. Anticancer Res. 19: 1961-1969. Hirota, S., Y. Ogawa, H. Seguchi. 1987. Histological analysis of lymphocyte subsets infiltrated into mouse tumor tissue exposed to local irradiation. Oncology 44: 312-318. Chakraborty, M., S. I. Abrams, C. N. Coleman, K. Camphausen, J. Schlom, J. W. Hodge. 2004. External beam radiation of tumors alters phenotype of tumor cells to render them susceptible to vaccine-mediated T-cell killing. Cancer Res. 64: 4328-4337. Kotera, Y., K. Shimizu, J. J. Mule. 2001. Comparative analysis of necrotic and apoptotic tumor cells as a source of antigen(s) in dendritic cell-based immunization. Cancer Res. 61: 8105-8109. Melcher, A., M. Gough, S. Todryk, R. Vile. 1999. Apoptosis or necrosis for tumor immunotherapy: what’s in a name?. J. Mol. Med. 77: 824-833. Chen, Z., T. Moyana, A. Saxena, R. Warrington, Z. Jia, J. Xiang. 2001. Efficient antitumor immunity derived from maturation of dendritic cells that had phagocytosed apoptotic/necrotic tumor cells. Int. J. Cancer 93: 539-548. Dezso, B., G. P. Haas, F. Hamzavi, S. Kim, E. J. Montecillo, P. D. Benson, J. E. Pontes, R. L. Maughan, G. G. Hillman. 1996. The mechanism of local tumor irradiation combined with interleukin 2 therapy in murine renal carcinoma: histological evaluation of pulmonary metastases. Clin. Cancer Res. 2: 1543-1552. Chakraborty, M., S. I. Abrams, K. Camphausen, K. Liu, T. Scott, C. N. Coleman, J. W. Hodge. 2003. Irradiation of tumor cells up-regulates Fas and enhances CTL lytic activity and CTL adoptive immunotherapy. J. Immunol. 170: 6338-6347. Jurgenliemk-Schulz, I. M., I. B. Renes, D. H. Rutgers, L. A. Everse, M. R. Bernsen, W. Den Otter, J. J. Battermann. 1997. Anti-tumor effects of local irradiation in combination with peritumoral administration of low doses of recombinant interleukin-2 (rIL-2). Radiat. Oncol. Invest. 5: 54-61. Teitz-Tennenbaum, S., Q. Li, S. Rynkiewicz, F. Ito, M. A. Davis, C. J. McGinn, A. E. Chang. 2003. Radiotherapy potentiates the therapeutic efficacy of intratumoral dendritic cell administration. Cancer Res. 63: 8466-8475. Germain, R. N., M. K. Jenkins. 2004. In vivo antigen presentation. Curr. Opin. Immunol. 16: 120-125. Ganss, R., E. Ryschich, E. Klar, B. Arnold, G. J. Hammerling. 2002. Combination of T-cell therapy and trigger of inflammation induces remodeling of the vasculature and tumor eradication. Cancer Res. 62: 1462-1470. Matzinger, P.. 2002. An innate sense of danger. Ann. NY Acad. Sci. 961: 341. Kim, K. W., S. H. Kim, J. G. Shin, G. S. Kim, Y. O. Son, S. W. Park, B. H. Kwon, D. W. Kim, C. H. Lee, M. Y. Sol, et al 2004. Direct injection of immature dendritic cells into irradiated tumor induces efficient antitumor immunity. Int. J. Cancer 109: 685-690. Liao, Y. P., C. C. Wang, L. H. Butterfield, J. S. Economou, A. Ribas, W. S. Meng, K. S. Iwamoto, W. H. McBride. 2004. Ionizing radiation affects human MART-1 melanoma antigen processing and presentation by dendritic cells. J. Immunol. 173: 2462-2469. Balkwill, F.. 2004. Cancer and the chemokine network. Nat. Rev. Cancer 4: 540. Ryschich, E., J. Schmidt, G. J. Hammerling, E. Klar, R. Ganss. 2002. Transformation of the microvascular system during multistage tumorigenesis. Int. J. Cancer 97: 719-725. Quarmby, S., R. D. Hunter, S. Kumar. 2000. 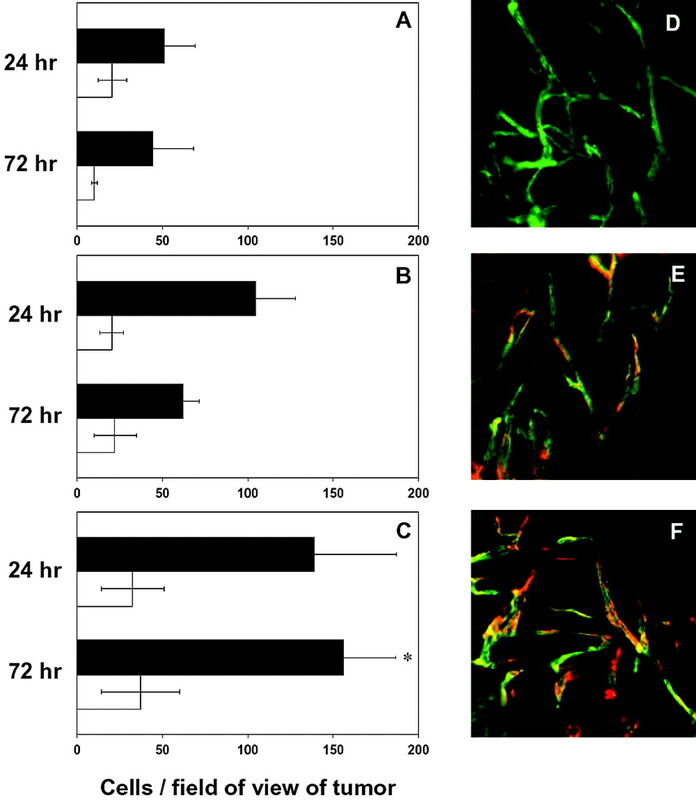 Irradiation induced expression of CD31, ICAM-1 and VCAM-1 in human microvascular endothelial cells. Anticancer Res. 20: 3375-3381. Garbi, N., B. Arnold, S. Gordon, G. J. Hammerling, R. Ganss. 2004. CpG motifs as proinflammatory factors render autochthonous tumors permissive for infiltration and destruction. J. Immunol. 172: 5861-5869.